Berberis thunbergii flowers. Richard A. Howard Image Collection, Courtesy Smithsonian Institution, hosted by the USDA-NRCS PLANTS Database. (Accessed 7/2014). Berberis thunbergii is a shrub to 0.3-3 m. tall, multistemmed and much branched, stems spiny, wood bright yellow, bark gray, shredding. Berberis thunbergii leaves. Pat Breen, Oregon State University, Landscape Plants. https-//landscapeplants.oregonstate.edu (Accessed 10/2017). 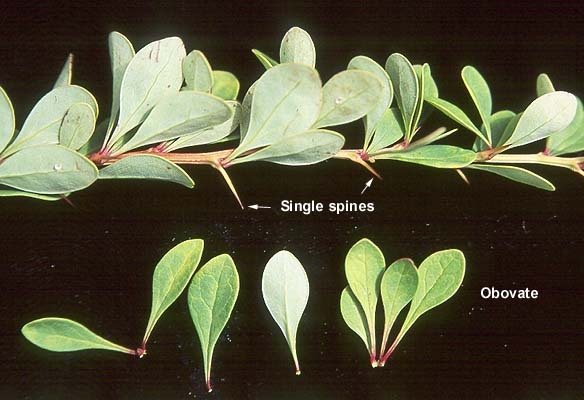 Leaves alternate, mostly in dense spirals on very short shoots opposite spines, stalk 0-0.8 cm long, blade 1-3 cm long, 0.6-1 cm wide, spatula- to inversely egg-shaped (obovate), tip rounded, base tapered to stalk; surface dull, green to dark red; margins smooth (entire) (Flora of North America 1993+); the cultivars with dark red foliage are derived from a naturally occurring variation, B. thunbergii var atropurpurea (Brand 2001). Berberis thunbergii flowers. ©2007 Gary Fewless. Herbarium Cofrin Center for Biodiversiry. University of Wisconsin Green Bay. Invasive Plantts of Wisconsin. uwgb.edu (Accessed 10/2017). Flowers yellow, radially symmetrical, 0.8 cm wide, petals and sepals 6 each in two rows of three, above 2-3 smaller, often reddish bracts; stamens 6, ovary superior; inflorescence of 1-3 flowers on slender stalks, dangling at each node along underside of branches; blooms May-June. Berberis thunbergii (fruit).Liba Kopečková.www.summitpost.org ( Accessed 7/2014). Fruit fleshy, red, to 1 cm long; ripens Sept.-Nov., persistent, pulp lipid <10% (White and Stiles 1991), bird dispersed, especially wild turkey, also dispersed by deer (Ehrenfeld 1997). 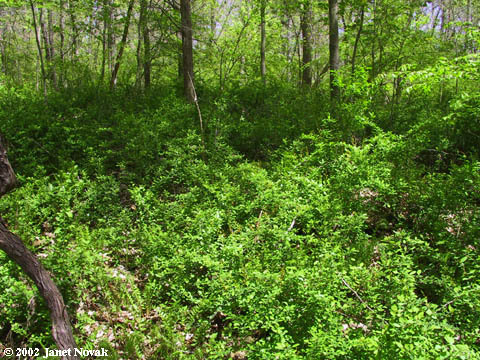 Habitat: Understory of disturbed woods, especially in alkaline soil, tolerates soil pH 5.5-7.2 (USDA, NRCS 2007). Shade tolerant. 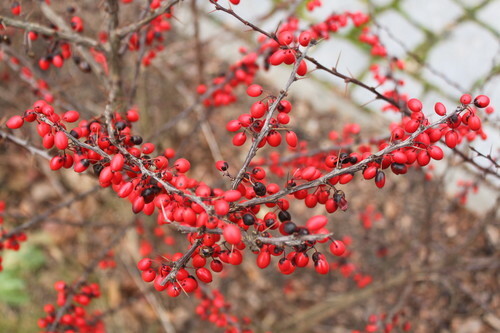 Berberis thunbergii (invaded woodland).Janet Novak.www.ct-botanical-society.org. (Accessed 7/2014). Notes: Displaces native herbs and shrubs (Young 1996). May form large monocultures (Ehrenfeld 1997). Some varieties carry the black stem-rust of wheat ( Puccinia graminis ) due to this B. thunbergii is banned in Canada (Flora of North America 1993+). 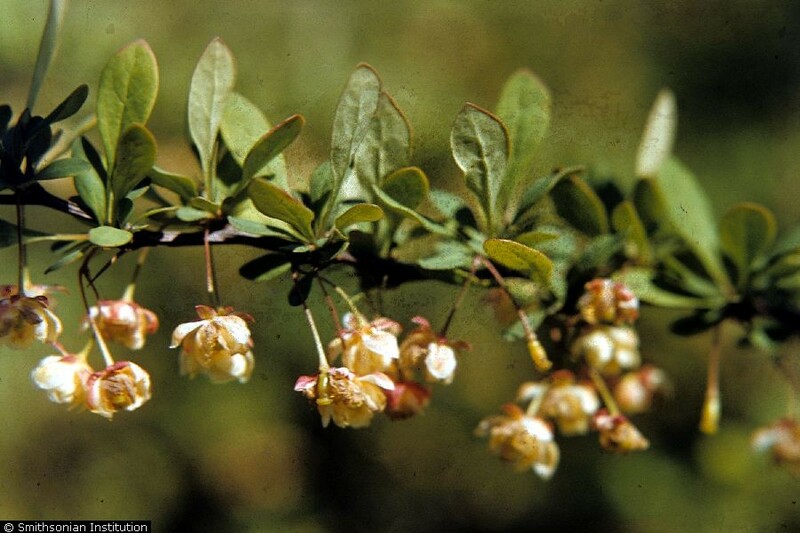 Japanese barberry is listed as invasive in Connecticut, and prohibited in Massachusetts (USDA, NRCS 2007). 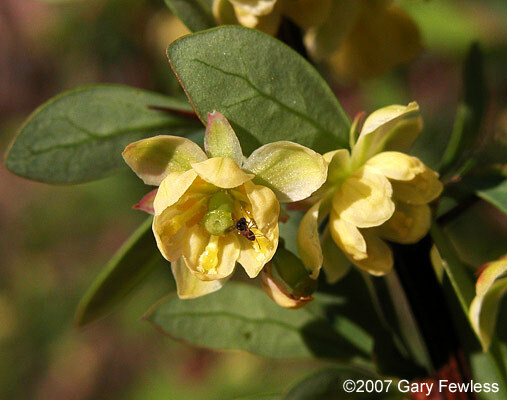 It is listed as an invasive by Plant Conservation Alliance Alien Plant Working Group (Swearingen 2007). It was listed as one of the “top twenty” invasive alien plants by the NYS Natural Heritage Program’s Ad hoc committee on invasive plants. However, it is still sold and regularly planted as an ornamental. Large stands found to increase soil pH and nitrogen content (Kourtev et al. 1999).